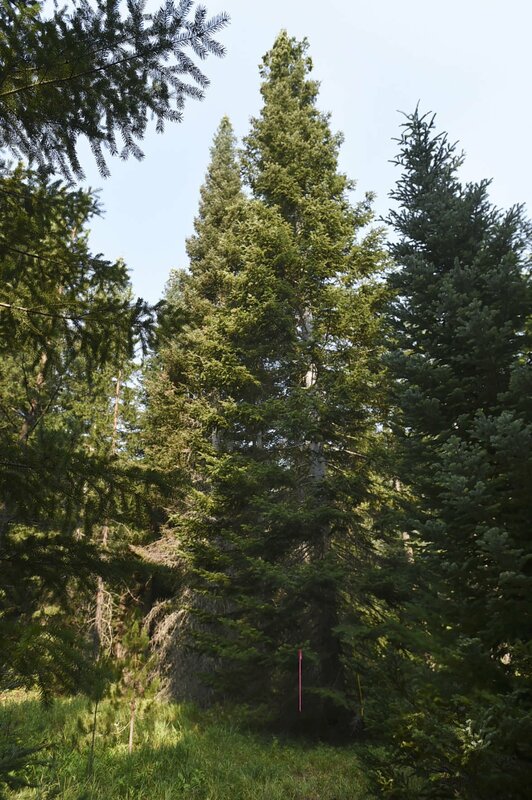 Jim Kaufmann, director of the Capitol grounds arboretum, evaluates a Grand Fir in Big Springs Sno Park, one of the contenders for Capitol Christmas Tree on Wednesday, Aug. 8. An 80-foot Grand Fir in Big Springs Sno Park, one of the contenders for Capitol Christmas tree, is seen on Wednesday, Aug. 8. Large ornaments that will be sent with the Capitol Christmas Tree. SANTIAM PASS — Finding a "nice" Douglas fir, grand fir or noble fir Christmas tree on the Willamette National Forest is easy. After all, there are millions of potential candidates. But finding the "perfect" tree to grace the nation's Capitol in Washington, D.C., is quite a different story, Jim Kaufmann, director of the Capitol grounds arboretum, explained Wednesday morning at Big Springs Sno Park near the Santiam Junction. Ever since last winter, when ranger Nikki Swanson announced the Capitol tree would come from the Sweet Home Ranger District, a team of Forest Service employees and the general public have been looking for just the right tree that will be decorated with thousands of handmade ornaments from Oregonians and others. The last time a Capitol tree came from Oregon was in 2002, from the Umpqua National Forest. Kaufmann said he helped select the official tree last year, but this is his first year to make the decision entirely on his own, adding, "I will remember this forever." "The team has selected some very nice trees as candidates," Kaufmann said. "There is potential in every tree, but ultimately it has to look good from 360 degrees in front of the Capitol." Kaufmann had five trees to consider. Four are on the Sweet Home Ranger District and the fourth is on the McKenzie Ranger District. Two are Douglas firs, two are noble firs and the fifth tree is a grand fir, which was the first candidate of the day. The "tree team" found 15 to 20 candidates and narrowed the field to five, said team member Molly Juillerat of the Middle Fork Ranger District. Juillerat said she thought "it would be easy, but it actually was quite difficult." Environmental issues also had to be considered, as well as whether the tree could be accessed with two big cranes and a semi-truck and trailer without causing damage to meadows, streams or animal nests in November when it could be raining or snowing. Kaufmann said the fact the tree will be placed in such a visible venue heightens the difficulty. "You have to remember this tree will be placed in the people's front yard," Kaufmann said. "It has to be big — 70 to 80 feet — and it can't be too wide, since it has to fit on a trailer." Kaufmann said 30 feet is about the right width. "It should be full, but trees in our forests are shaped by nature, not to be in someone's front yard," Kaufmann said. "Did other trees shade out one side? Did a fire affect it at some time? It is the people's tree. We don't want to disappoint the American people." Kaufmann used binoculars to begin his analysis. "It is a beautiful tree," Kaufman said of the 80-foot tree estimated to be about 80 years old. "Its upper branches are full, it has a single stem and has a nice cone set." He estimated the trunk diameter at 20 to 24 inches and said the tree's dimensions and structure should "make it easy to transport." Kaufmann pointed out that the lower back side of the tree was a bit thin branch-wise, but added that could be mitigated depending on how many feet of the tree are removed during set-up. "This tree has a nice thin, pyramid shape and that is good," Kaufman said. "It has nice branches and thick stiff stems that will hold the decorations well. This tree definitely has potential." According to Nikki Swanson, the winning tree will be announced at a ceremony on Nov. 2. Sweet Home is planning a day-long celebration that will culminate with a twilight parade on Nov. 9. The tree will begin its more than 3,000-mile journey retracing the Oregon Trail in reverse for its 175th anniversary and arrive Nov. 28 in Washington, D.C. A formal lighting ceremony will be held in early December. Swanson said 70 smaller companion trees 6-to 10-foot-tall will also come from the forest or area Christmas tree growers and will decorate Capitol offices. Some 10,000 ornaments are needed to decorate the Capitol tree and the companion trees. Numerous ornament-making parties have been held throughout the mid-valley. "We still need about 2,000 ornaments, mostly large ones that are 9 to 12 inches," Swanson said. "They should reflect life in Oregon, our cultural heritage, events and natural resources. The more sparkle the better. No logos, please." The next ornament events will be held from 10 a.m. to 5 p.m. Aug. 25 and Sept. 1 during the Oregon State Fair. The final ornament-making party will be held from 10 a.m. to 2 p.m. Oct. 13 at Sankey Park during Sweet Home's annual Harvest Festival. To learn more, call the Sweet Home Ranger District at 541-367-5168 or visit www.capitolchristmastree.com. Ornaments must be turned in at the Sweet Home Ranger District, 4431 Highway 20, Sweet Home, no later than Oct. 1.